A glimpse back at the bygone days of April 1989. If it tastes good, who cares? See what’s in store at John Lewis White City! 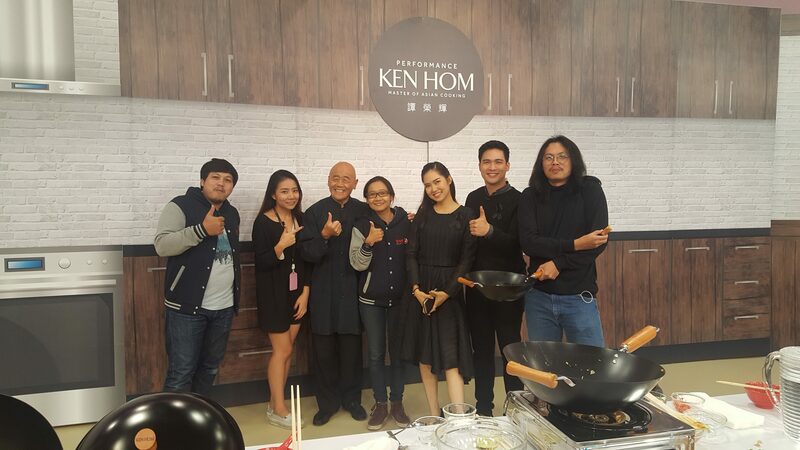 Recently I gave two Masterclass for Lee Kum Kee who makes the best and most authentic Chinese sauces in the world. 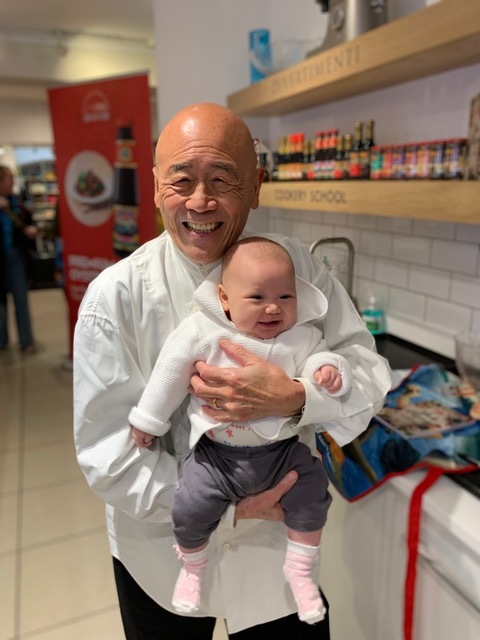 Then venue was at my favourite cookery shop in London — Divertimenti but the most unexpected guest was 3 month old: Sadie Chi-Yan Ma, the daughter of one of my students. My youngest fan ever! I fell head over heels for her! 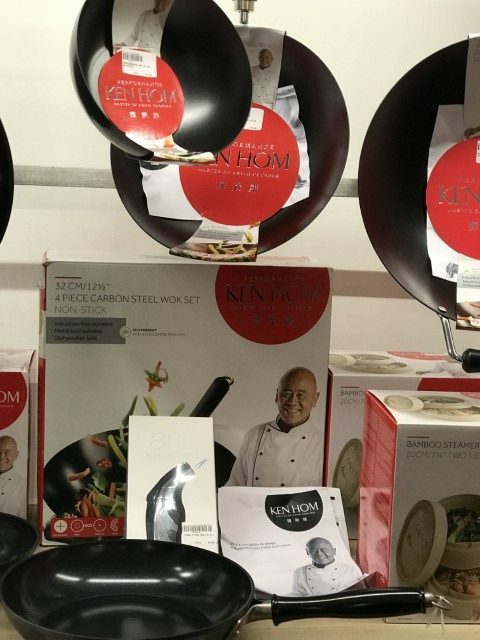 Check out Ken’s range of Woks! As a GREAT ambassador, it was a pleasure to appear at the VIV Asia 2019 show in Bangkok for two days. I love showing the world how good English beef and lamb could be, not only tasty but safe and traceable! Ken Hom dishing up a feast on the DKB stand at Ambiente. Kitchenware ranked as the top redemption category in the gaming marketplace! I had a grand time at the Zest Quest Asia Awards 2019 A magical evening! Ambiente in Frankfurt is the leading international and largest consumer goods trade fair in the world. 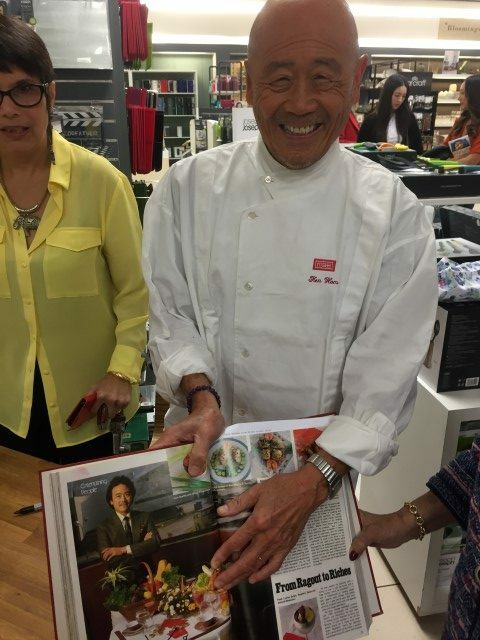 I gave two cookery demonstrations launching the new design for the Ken Hom wok. The art work by the famed Flemish artist who lives in Asia, Christian Develter was to say the least quite a sensation. Everyone loved it! It was the talk of the fair! I am devastated at the news of Chef Andrew Fairlie who was not only a great chef and a very good nice person. I wish to convey my condolences to his lovely wife and children! I was sadden to hear that my good friend, June Whitfield, passed away. She brought so much joy and laughter to all of us and I loved cooking for and with her! Getting ready to see the Queen when I was invited to Buckingham Palace on Tuesday night for a reception. Her Majesty looked splendid! I was thrilled to learn that I sold two dinners at a recent Action Against Hunger event for £15,000! It is a wonderful charity that helps people worldwide and I am proud to be an ambassador! His Royal Highness The Duke of Gloucester visits Thailand & presides at a fundraiser for Habitat’s efforts in Thailand. The Duke was the guest of honour at a charity dinner hosted at the British Ambassador’s Residence. 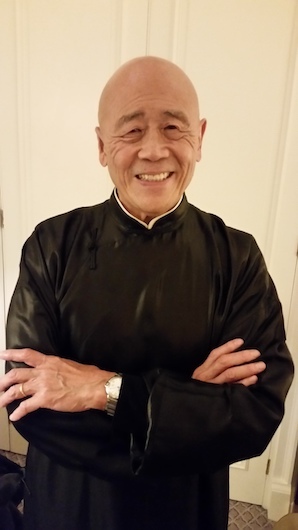 The menu for “Dinner with the Duke” was curated by Michelin-starred chef Ken Hom. A good friend of mine was in Alba, truffle hunting and spent and day in Turin, Italy and walked into a cookware shop and saw this display!!! It was a great pleasure to be part of supporting the annual Gala CharityDinner, “RMHC Family” in Hong Kong. Held at the JW Marriott Hotel which served a delicious dinner for over 200 people: Perfect home cured salmon started the meal, then a savoury cream of asparagus soup followed. A choice of moist Chilean sea bass with a ginger tomato sauce or a roast supreme of chicken which was very tasty. An exotic Mont Blanc dessert capped the evening in which the children performed Cantonese opera and Sam Hui, king of Cantopop directed a sing along. 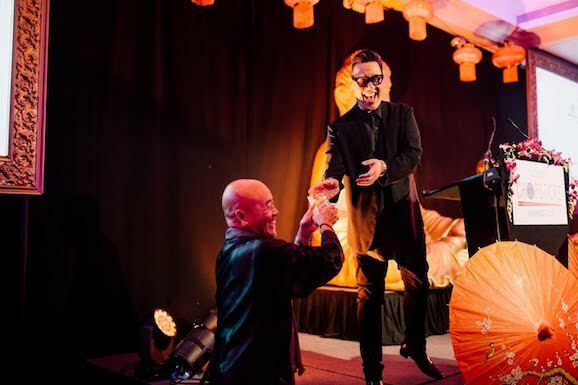 The event raised more than HKD5.7 million (£650,000) for keeping sick children close with their families during one of the most difficult phases in their lives.It was a fun and love filled evening for a very good cause! 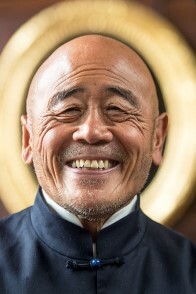 I am so sadden by Khun Vichai’s passing. He was a wonderful support for Leicester City and I loved how he was one of the best owner and leader for the club. We will all miss him! Hosted by the Oxford Cultural Collective, the Yan-Kit So Memorial Award for Food Writers on Asia is one of the UK’s most generous food-writing bursaries. 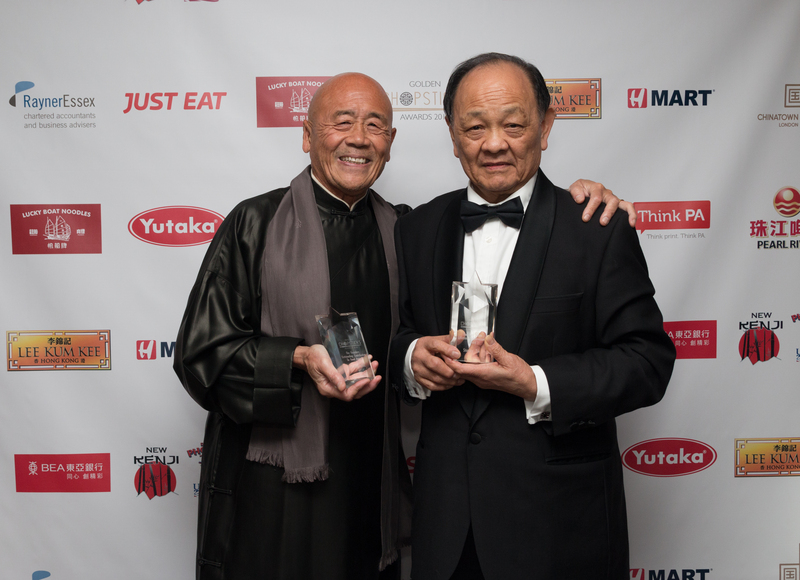 Applications invited for 2019 Yan-Kit So Memorial Award for food writers on asia. A huge thank you to everyone who came to see me during my tour around the UK. I was touched by all your kind comments and affection that you showed me. A few brought my first book published in 1984! But the most impressive was a lovely lady who lived in Hong Kong and she brought her cookbook with my Hong Kong menu and a photo of me from the early 80’s! Everyone had a good a laugh! I was on tour with my hot wok at the following venues. I was delighted to cook for you! Lee Kum Kee, of course, is known for its range of authentic Chinese sauces. But this summer, I have been experimenting with their sauces in other ways. 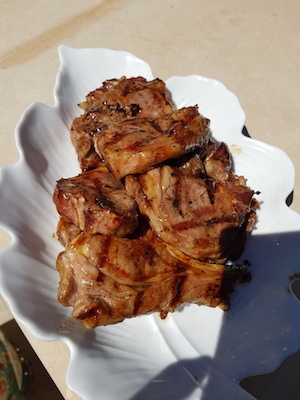 Here I barbecue organic lamb chops and spread their Char Siu Sauce (normally used with pork) and it was absolutely delicious. What a bonus to discover how versatile LKK sauces can be! One of many French summer treats are the many village fetes. On Thursday we had a tasting of rose wines and then an evening of delicious Paëlla cooked by Pascal (our village butcher.) We were entertained by a lovely band and ate and drank all night! Another memorable summer evening in southwest France. My good friend and inspiration Joel Robuchon has passed away at aged 73. A monument in our cuisine world, he was also a great teacher. He will be missed by all of us who learnt so much from him. All good things must come to an end. My long partnership with MEE restaurant in Rio de Janeiro has now ended. I wish the MEE team much success in the future. My good friend, Fabien Galtier, the famous rugby star dropped by and I had to give him a t-shirt! I also promised him a Chinese banquet! I have just received some breaking thrilling news: My Stir-fried Life will be published in Chinese next May 2019 by Wai Yan She the biggest Chinese state publishing house. I am delighted that France won the World Cup tonight. They played well……..it was an incredible game. I am completely devastated by England’s lost in tonight’s World Cup. The team played extremely well but were unlucky. I am over the moon over the English latest win in the World Cup. I watched every minute and congratulate the English team on a job well done. Now to the Finals! I would be more than thrilled to cook you a Chinese banquet when you win the World Cup! I am over the moon the England won! They deserved it!! I was thrilled that the English team won 2-1! I watched every second and want to send congratulations to the English team for a wonderful match! Now win the World Cup! Shocking news about Anthony Bourdain death at a youthful age 61. He brought the world of food, good cooking and chefs to everyone around the globe. He will be very missed! 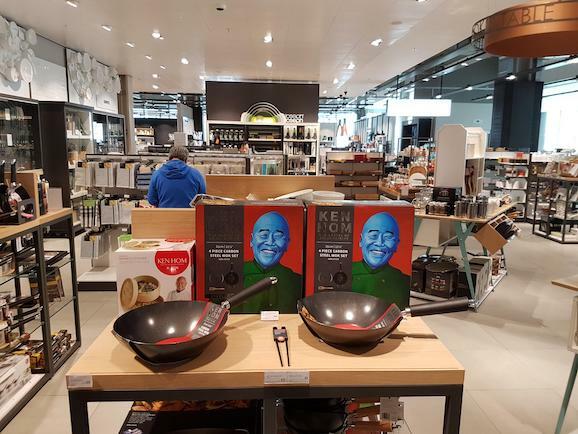 I had two wonderful sold out session of demonstrating my wok at NL Bijenkorf (the largest department store in Holland) in Amsterdam on Saturday. I was so touched when I discovered a family drove for 1 1/2 hours to come for the demonstration. It was a great sunny day as well! 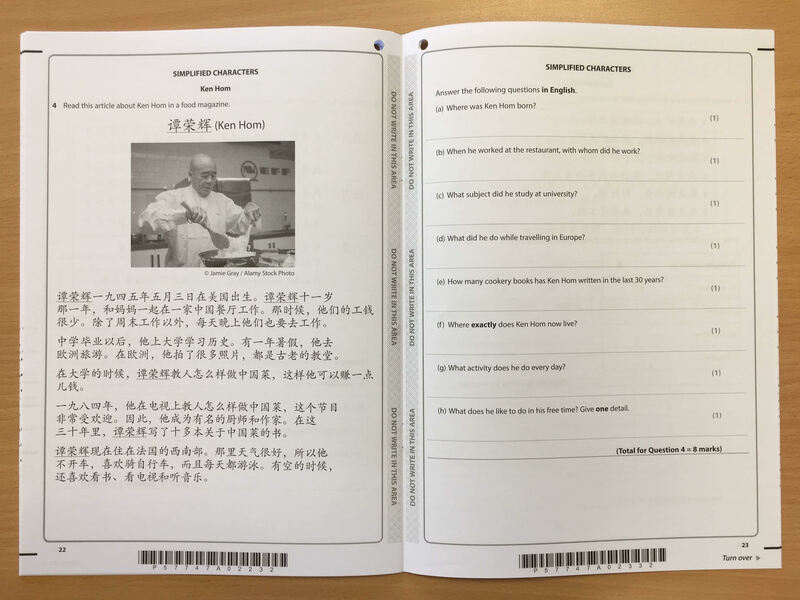 Apparently my story was on GCSE Chinese exam! A friend sent it to me. Very amusing! I am thrilled to hear that my good friend, Sir Alex Ferguson is out of intensive care and wish him a speedy recovery! I can’t wait to cook for him when he is better! A starter of braised leeks and caramelised onions in a rich hoisin sauce, a main course of egg fried rice with a vegetable stew of onions, courgettes and mushrooms with oyster sauce. We served baked apples with fresh cream for dessert and everyone was happy! 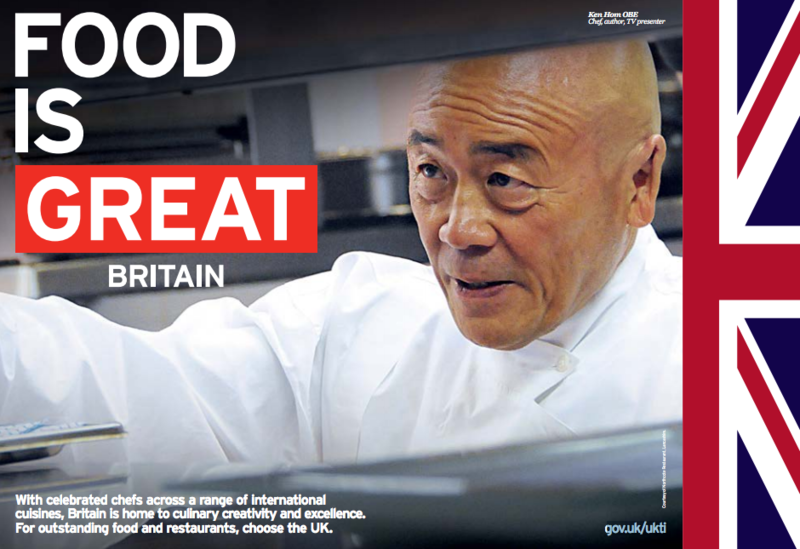 the UK, he was instrumental in making Asian tastes and flavours part of the UK food scene! Everyone is grateful and I am the first in the queue to salute this great man. I was honoured to be asked to participate in the 10 th anniversary of the Emirates Airline Literary Festival 2018 in Dubai. Over a dinner event where I talked about my latest book, My Stir-fried Life. The dishes came from the book and was well received with over 200 people attending. I also did a lovely interview with the lovely presenter, Rebecca (her mother, Mary was an old friend of mine) for Euronews as well as live radio for the festival. It was all a spectacular festival! I really enjoyed being interviewed by DubaiEye 103.8FM & sharing my experiences with everyone, including the time I cooked for the fabulous Tina Turner – I was in awe!I I have many more stories to tell you as soon I get a minute! Whilst in London during Chinese New Year, I was interviewed by The Caterer and below is the feature which has now come out. Enjoy reading it And yes, eat, eat, eat, it’s the only way you will learn about food! On Saturday Kitchen, BBC1 I enjoyed cooking with two great chefs: Chef Angela Hartnett who was the host and Chef Tristan Welch. I was also thrilled to meet and cook for the special guest, Gregory Porter who I have been a fan for ages. A super singer and amazing jazz musician. I immediately streamed his new album which was a homage to Nat King Cole! It’s Chinese New Year – tune into the Steve Wright’s in the Afternoon Show to hear all about Chinese New Year and get my tips for some great festive food – 2 to 5 pm. 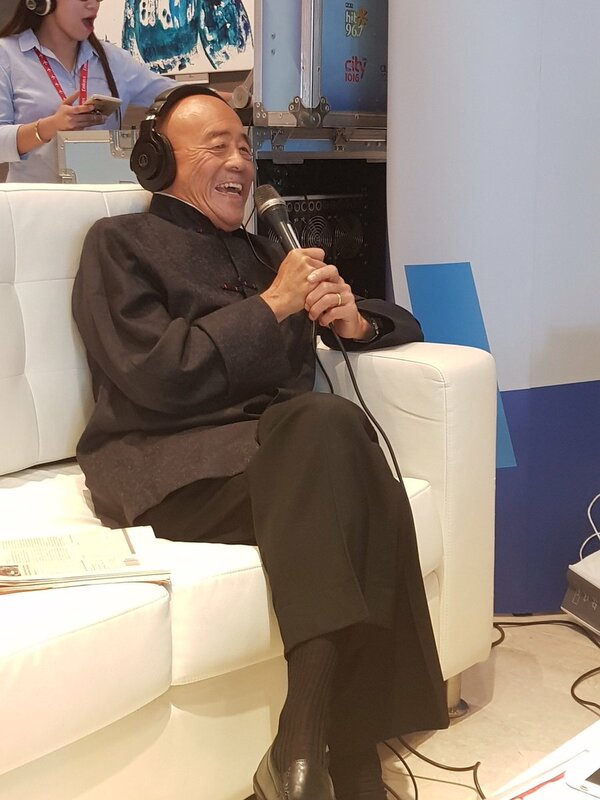 For all my followers in Wales, tune in on Friday 9 February to hear me talk with Wynne Evans about Chinese New Year, Chinese recipes, my autobiography and more from 12 noon onward. Delight your senses on an exploration of Vietnam’s finest cuisine with Ken Hom in Ho Chi Minh City. 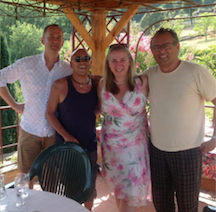 The tour is on the 9-23rd of March & Ken Hom will join you on days 12 and 13 of the tour. Together you will explore the aromatic scents and fresh flavours of local produce in one of the city’s bustling food markets before a private cooking demonstration, during which Ken will reveal the secrets to creating sumptuous Vietnamese cuisine. You will also have the opportunity to hear stories from his venerable 35-year career and pose your own culinary questions during a private talk and informal Q&A. 9 March 2018. 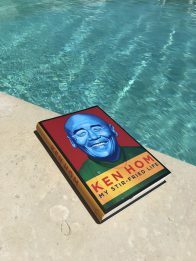 Ken appeared at the Emirates Literary Festival in Dubai at a special dinner talking about his latest book: My Stir-Fried Life. I hope you were able to to see me at the Althorp Literary Festival on the 5th of October! I was thrilled to be invited by Charles Spencer to the 14th Althorp Literary Festival to speak about my latest book, My Stir-fried Life. I was moved by everyone who came to my talk. I had a wonderful time sharing my hilarious life experiences at Althorp. It was such a delight for me to host and cook for four generous donors to Action Against Hunger last night at my flat here in Bangkok. The menu included Crispy Salt & Pepper Prawns, My classic Roast Pork belly with Truffle Risotto and organic salad. A warm Thai mango compote with vanilla ice cream topped off the evening. We drank a wonderful selection of premium sake with the dinner. Rupert, Clare, Paul and Gudrun as you can see from the photos were very happy and I again thank them for their contribution to AAH! I made an annual journey to Hong Kong every year in support of the RMHC Hong Kong charity, helping to raise funds so that ill children and their families can stay together until they recover. This year we raised HID$3.8 million (£380,000) in one evening and the theme was Star Wars and I had to have a photo with the storm troopers and another with, my good friend, Grace who is the chairperson and Iris Wong, the head of the house. Although it was as usual held in a large hotel, the JW Marriott, the food for five hundred people was delicious. We began with Ahi tuna with king crab and Hokkaido scallop ceviche on a bed of slice watermelon with mango-ginger dressing which was a perfect light starter. The cream of celeriac soup with green apple and bacon lardons was absolutely delicious as was the Herb crusted Chilean sea bass with aubergine confit, tomato fondue, black olive potato and saffron sauce — moist and cooked as if it was from a restaurant kitchen. My hats off to the hotel kitchen crew. A lovely Citrus white chocolate mousse with a Yuzu curd and vanilla sable helped seal the evening! A worthy and delicious cause! Fish & Chips is without any doubt my favourite British dish. Every time I set foot in the British Isles, I immediately head to satisfy my addiction to fish & chips. 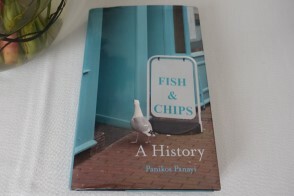 So I was thrilled to read Panikos Panayi’s book: Fish & Chips – A history. It was fascinating for me to learn how fried fish was introduced by immigrant Jews, how fried potatoes came via France and how other migrant communities, including the Chinese play a part in fish & chips. It is amazing book on one of the most popular British dish and I highly recommend it. Please excuse me, I must run to have my fish & chips! Crispy Noodles and tender chicken pair together perfectly for this comforting dish. It’s a firm favourite among dim-sum diners in Hong Kong. I was very sad to learn of the death of my friend, the great chef, Paul Bocuse at age 91. I first met him in 1984 at his restaurant. He was an inspiration to chefs worldwide, not only in France and was incredibly generous to young chefs as a mentor. He will be missed by chefs worldwide. It was with great sadness when I learn the death of my good friend, Jacques Pébeyre at age 91. He was my mentor for truffles and was like a father to me. Jacques was a giant in the food world, selling the best truffles to chefs all over the world. He had a wonderful palate as well but it was his humour and gentleness as well as the great respect that he commanded which marked him as a very special person. His family welcomed me as a member and I shall miss him as much as they will. Last Saturday, I’m extremely pleased that we raised £353,267 from the Action Against Hunger Fine Wine Auction and dinner! This amount was doubled with the assistance from the UK government and it was a pleasure working with the other wonderful chefs such as Ollie Dabbous, the fabulous Michel Roux and Paul Ainsworth. I made Crispy Chicken Sun-dried Tomato Spring Rolls which I demonstrated on Saturday Kitchen! As Ambassador for the charity, I was thrilled to contribute offering two dinners at my home for an incredible £16,000 in total. It was such a memorable and magical evening with Hugh Bonneville as host and guests such as Marx Hix, Rick Stein, Neil Borthwick as well as my very good friend, Sabrina Ghayour. A huge thank you to Samuel Hauenstein – Swan for Action Against Hunger UK for the brilliant photos that captured each wonderful moment. 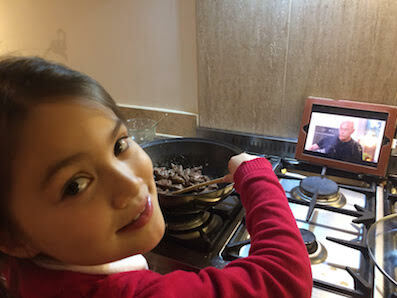 I was delighted to get this photo of 7 year old Meili cooking from one of my recipes and in her Ken Hom wok! She must be one of my youngest and cutest fan! 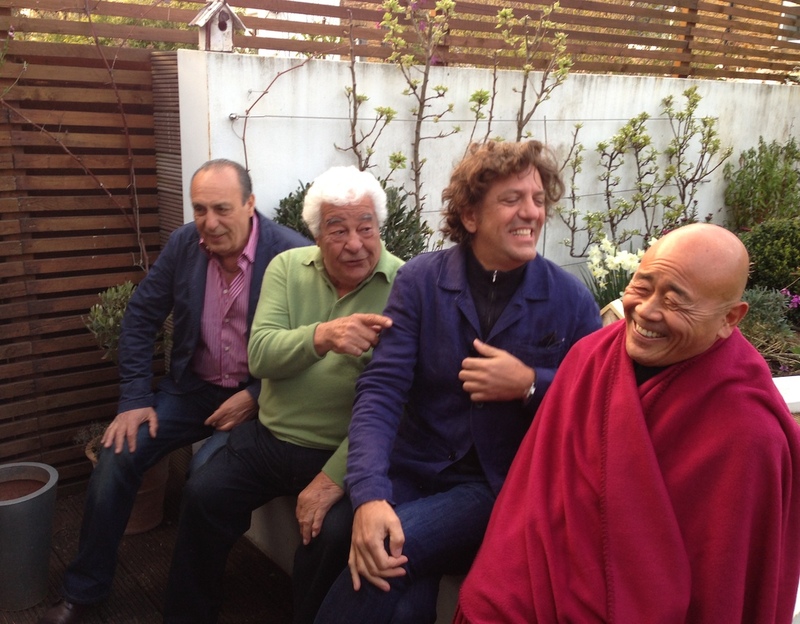 I am devastated to hear the news of my good friend, Antonio Carluccio’s passing yesterday. He has been a dear friend and an inspiration to me for over 38 years and it is hard to imagine a future without his jovial smile and laughter which easily fills the room. But he was also a sweet and generous man and incredibly sharing which perfectly reflected the essence of Italian food. I will miss him greatly! 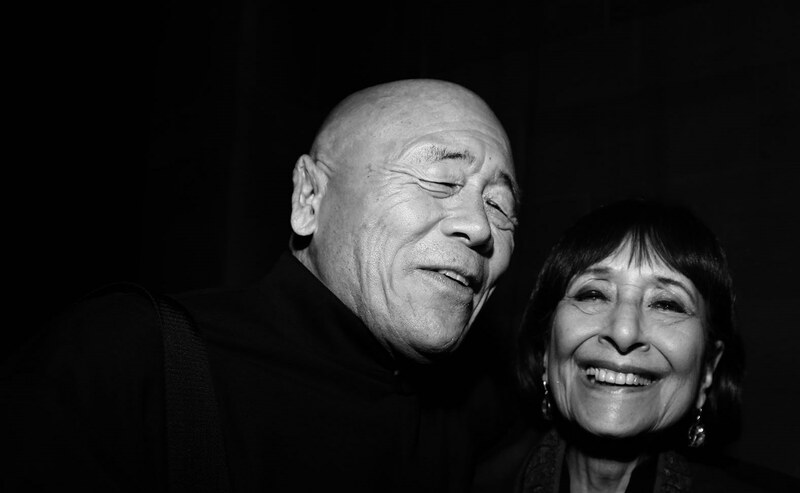 This photo taken by the great KT Bruce, the photographer for the Oxford festival of my good friend, Madhur Jaffrey and myself. I think it captures not only our long friendship but our mutual love affair for good food and life! My good friend, Vanessa Hwang runs one of the best food charity – Food Link in Hong Kong. They take all the left-overs from hotel buffets and their chefs reinvent dishes based on what they get. Sometimes, even lobsters are on the menu! It is a fantastic idea which is spreading all over the globe and I hope it will come soon to London. Here is a recent video on Food Link in Hong Kong. I am super delighted that Andrew Wong has finally got his long over due Michelin star! 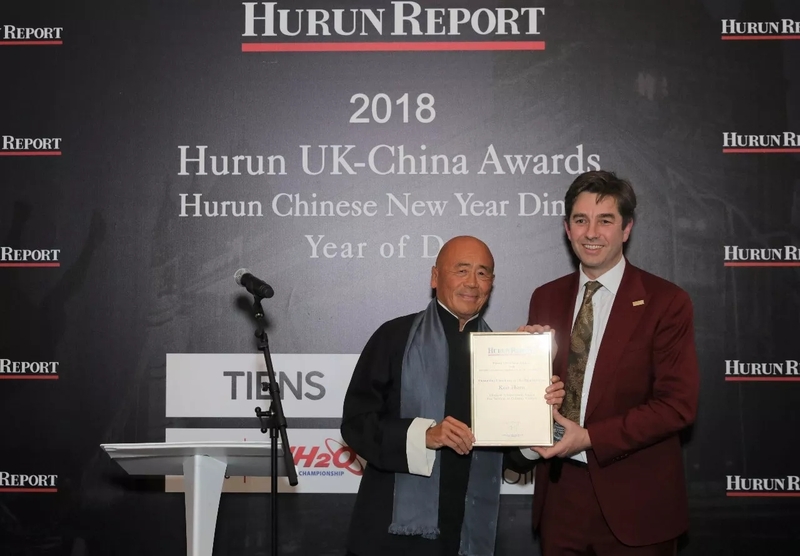 My heartiest congratulations to him, I think he is the top Chinese chef cooking in London if not the UK! The Cookery Class held recently at my Michelin star MEE restaurant at the Belmond Copacabana Palace in Rio for the main influencers was a huge success I am pleased to report! Click here for details (in Portuguese) I demonstrated unusual dishes such as stuffed peppers, bean sauce noodles and my favourite Salt & Pepper Prawns! I have seen over my 17 years visiting Rio de Janeiro the immense changes in food and the intense interest now in especially Asian cuisine. So I invited some top social media foodies bloggers to MEE to sample some of our new offerings in a cooking class. It was a dim sum tour of China with Peking dumplings from Northern China, Sichuan spicy dumplings from Western China and finally Prawn toast from my region in southern China. Viva Rio de Janeiro! 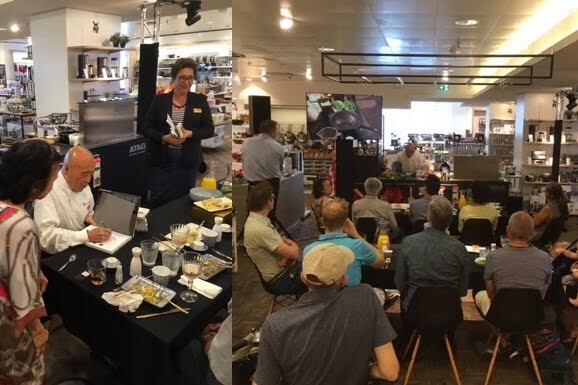 I had the most wonderful time demonstrating at the Bijenkorf department store this weekend and I was very touch by the eager and enthusiastic interest in two sold out sessions. Of course, I used Lee Kum Kee sauces which are easily available in Holland! I can’t wait to make a return visit! My good friend, Sir David Tang left this planet the way he has always lived with style! I will miss him and especially his humorous columns in the Weekend FT. 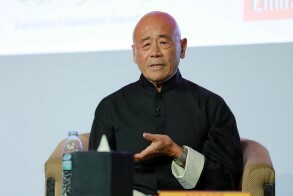 The Ken Hom wok was displayed recently at the China International Modern Home Expo —— here are photos from China Daily!! 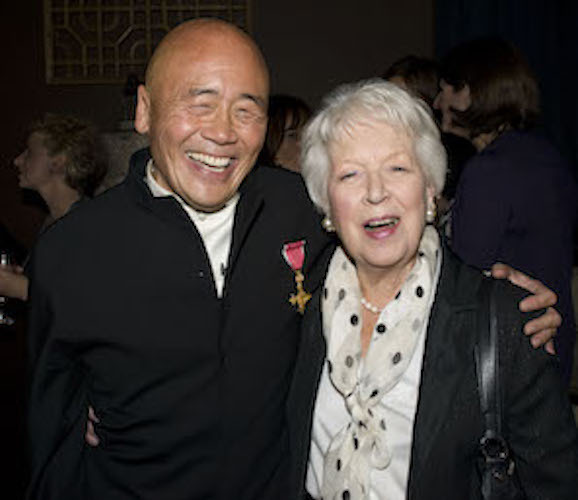 I would like share this video from the National Education Association where one of my closest and best friend, Kent Wong received a civil and human rights award. I am so proud of him and his achievement! A few days after MEE received the VEJA award, MEE received the award of 5 Forks in the Rio Gastronomia! We are thrilled that the top magazine in Rio de Janeiro VEJA has picked MEE once again as the Best Oriental restaurant in Rio! 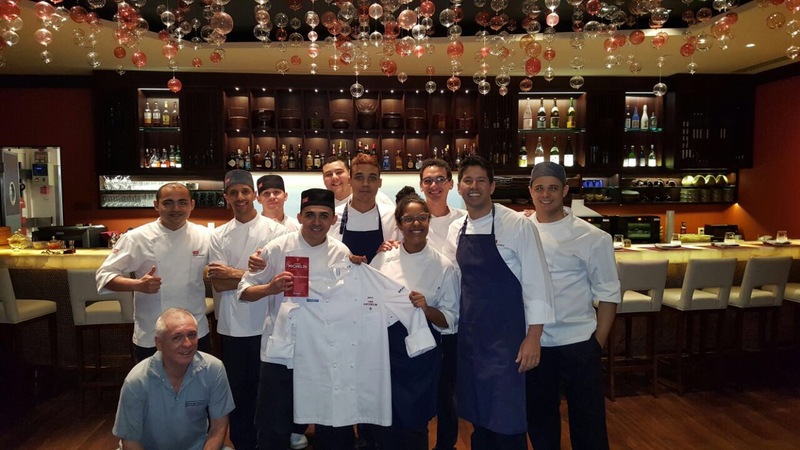 Congratulations to all our kitchen and service team! It was such a thrill to meet, dine and drink with one of my favourite BBC correspondent, Caroline Wyatt and my good friend Mary! She is as wonderful in person as she is on the screen and she loves good food! 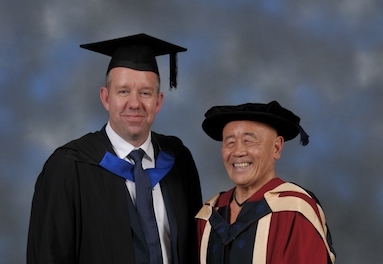 I was honoured last week when I was asked to give the graduation speech at Oxford Brookes University. Throughout my nine years of association with the university, especially the Oxford School of Hospitality Management, I was inspired by the many students who came from all over the world. But the greatest pleasure has been working with Don Sloan​ the Head of School. His impressive leadership and connection with the students help make the school one of the best in the world! My heart goes out to the victims of the Grenfell Tower tragedy as well as to all their friends and family. It is hard to express my profound sorrow for everyone’s suffering! My heart goes out to the victims of the horrible attacks in London. I am praying for their families and friends. I was shocked by the attack on one of my favourite UK cities – Manchester. Senseless violence against innocent people must be condemned. I stand firmly today with everyone in Manchester and grieve with them. I wanted to share with you a feature from a Chinese website which has over 800 million visitors a month. It’s titled : ‘What the British called the Chinese food godfather had his origins in Kaiping’. It is a piece introducing me to the Chinese public…it is about all that I have done to promote Chinese food and culture to the West. Here is the piece here and you can click the ‘translate’ button which comes up on the right hand side of the page, in the chrome browser, when you follow the link, to see the english translation. There is also a video included. Do enjoy! I recently spent the weekend with Pamela Ratiu at their family foundation in Transylvania. It was a first for me and on Saturday, I was honoured to meet HRH The Prince of Wales again. We first met over thirty years ago when we both had hair and he still has plenty! We discussed Alice Water’s Edible Schoolyard charity in Berkeley, California of which I have been a supporter since the beginning. Sustainable, good organic food for everyone is one of Prince Charles’ goals which I fully support! Roy Ackerman. I was deeply sadden to learn of the passing of Roy Ackerman, one of the giant in our hospitality industry. I was privileged to meet him on numerous occasion and found him a true foundation of knowledge and inspiration. He will be sorely missed by all of us! I am delighted to announce that my restaurant MEE at Belmond Copacabana Palace in Rio de Janeiro has retained its Michelin star for the third year running! There are only six restaurants in Rio with Michelin stars, one star being the highest score anyone has. I am so proud of my kitchen and restaurant team, well done everyone! Our great kitchen team who has maintain the quality and consistency of MEE! Congratulations to all of them for maintaining our Michelin star for the third year in a row! You are the best! I had a fabulous time showing how to easily make four dishes in no time, last Saturday afternoon at the Outburst Festival sponsor by Oxford Brookes University! All cooked in just one Ken Hom wok! 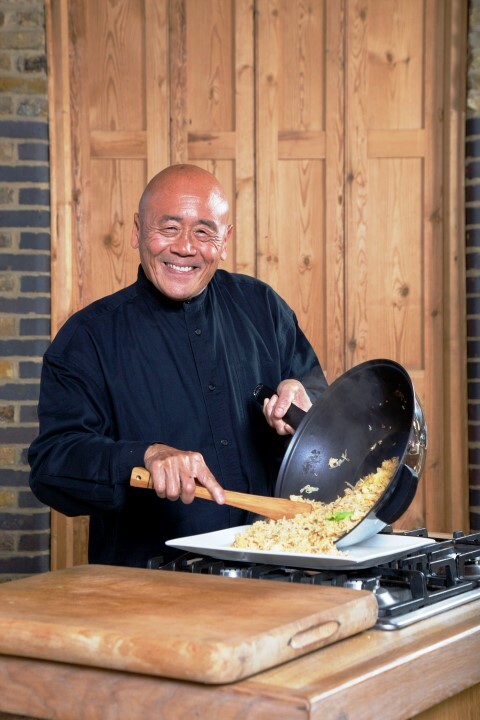 I had a fabulous time showing how to easily make four dishes in no time, at the Oxford Brookes University Festival All cooked in just one Ken Hom wok! I am such an irresistible cat lover. I fell in love with Whiskers at the Oxford home of my friends. She was so lovable at 17 years old! Another favourite photo that a fan sent me about 2 years ago when he captured his cat nesting in his Ken Hom wok! That is a cat with great taste! When I reflected on the sad recent events in London, it made me want to reread one of the most uplifting books I have read in recent years. It is called Progress and a well written case for optimism and how far mankind has come in the last few hundred years. What is especially touching for me with my work with Action Against Hunger is the progress we have made to eliminate hunger and boosted nutrition. We all need to share good food together for a better world! Over a million children are at imminent risk of dying from life-threatening hunger across Nigeria, Somalia, Yemen and South Sudan. My great friend and fantastic photographer, KT Bruce took this photo of me with Maureen Lipman, the famous actress and author at the closing dinner of this year’s Oxford Literary Festival! Congratulations to all as this was one of the best festival of all time and celebrating the 21 st year anniversary as well! Sharing with you my beautiful day & evening at Ocean Place. I was touched by everyone I met and the support they showed by buying my book — which all went to Action Against Hunger. My guide and host, John Butterworth showed me the charms of Poole! I was lucky to be at the fabulous Ocean Place last Saturday for an event benefiting my favourite charity, Action Against Hunger. I made an interesting menu with the talented kitchen head by Chef Ping. It was a sold out event and with all the lovely people who came, it was a love fest! Zoe Wilson who organised it and her beautiful mum, both made my evening. The setting was one of the most beautiful I have seen in Poole, right on the beach. We also did a Facebook interview live! Ken was in the Foodie Lab at this year’s Ideal Home Show. This photo was taken at my talk at the Oxford Literary Festival earlier this month. Frank is the photographer for Oxford Brookes University and often takes photos of events I have been involved in. There was a light on the wall and he could not resist taking it…he said the halo fitted me well! 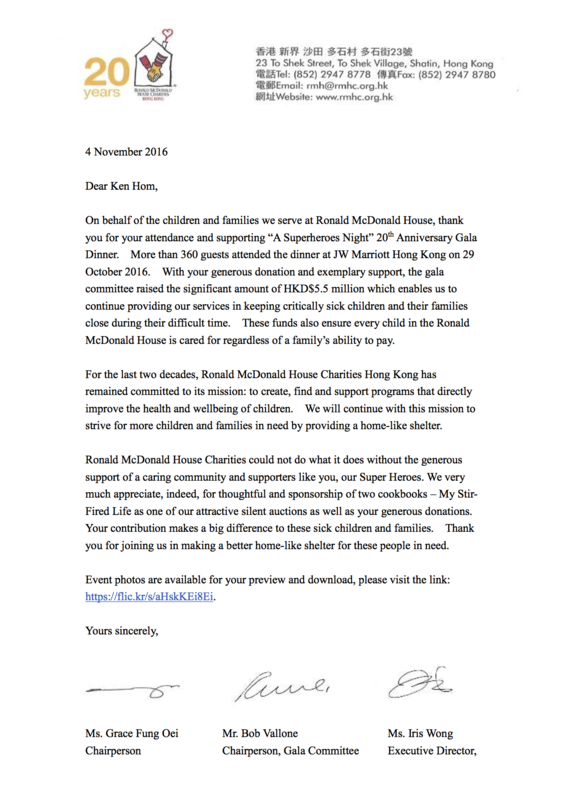 Ken supporting the Ronald McDonald House Charity at the “A Superheroes Night” 20th Anniversary Gala Dinner at the JW Marriott Hong Kong on 29 October 2016. Helping to raise more funds for the RMHC Hong Kong, a children’s charity. Chef Jacky Yu was generously let Ken use his cooking school to cook for Bob, Marlene, Grace, Kendall & Christian! My friends, the Pebeyres helped by providing the truffles. 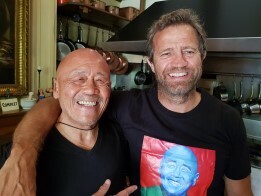 I was very excited to be hosting friend and actor Stanley Tucci and his wife Felicity and the head of Fortnum & Mason Ewan Venters at my home in Paris they were the top bidders for a meal with Ken Hom for Action Against Hunger Benefit Dinner, and a lot of money was raised on the night for this worthy charity. We start with fresh black truffle ‘sandwiches’ and champagne, plus many other delicacies, with wines to match of course! We won another prestigious award again for MEE It is the restaurant of the Year award given by the government tourist bureau. 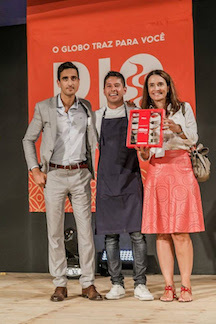 There to receive the award was Rejane, our sake expert; Wemerson Oliverira, our assistant manager and Chef Guido, our talented young sous-chef! Bravo, well done. At our Michelin star pan-Asian restaurant, MEE in Rio de Janeiro, we use only Maldon sea salt because it is the best in the world. I was incredibly gutted when I heard that my friend, AA Gill has passed away. It was a bit of a shock as I was with him at the China Exchange at the end of Sept and he was in prime form. A great food lover & writer. I will certainly miss him! Listen to Ken talk about his life with Steve Allen on LBC. 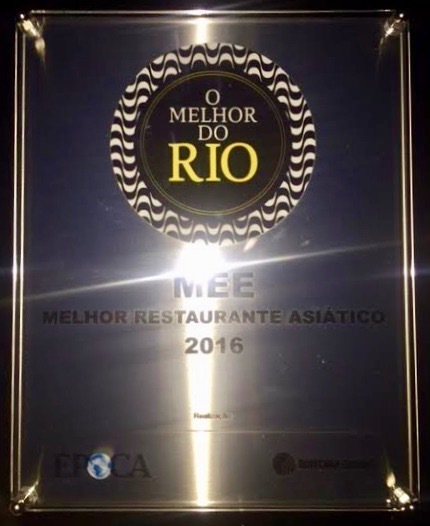 MEE has just won the Best Asian Restaurant Award in Rio de Janeiro! Congratulations to all our fantastic team in the kitchen as well as in the dining room! 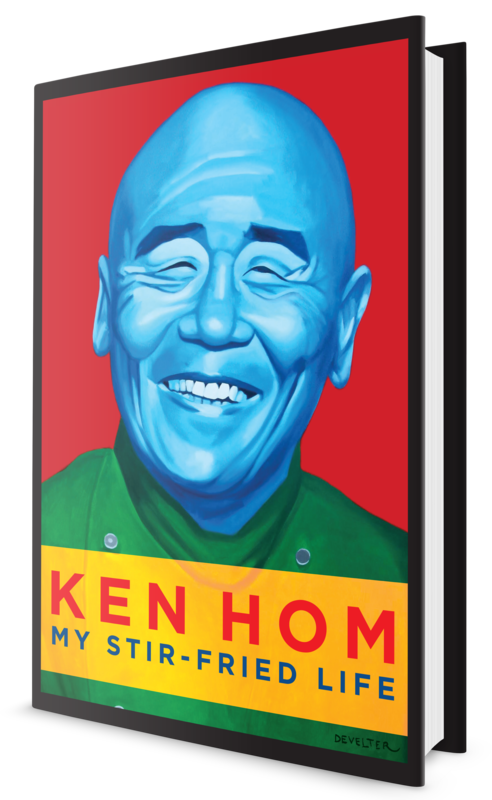 Ken Hom’s autobiography ‘My Stir-Fried Life‘ released 29 September 2016! – ‘My Stir-Fried Life’ is a high-spirited, life-enriching feast in an ever-sunny world, where the chopsticks never stop clattering, the platters are always abundant, and dreams – no matter how ridiculously unbelievable – can and do come true. Ken’s good friend Grace, who is the chairperson of RMHC HK, has just sold another copy of my latest book ‘My Stir-Fried Life‘ for HKD 10,000 raising a total of HKD 48,800 (over £5000) for RMHC HK, the children charity in Hong Kong !!! I am delighted that my books are being put to good use. Proud to have supported Action Against Hunger again this year and help raise a record £338,135 for this worthy charity. I’m delighted to be supporting the GREAT Britain campaign. Check out this link of me in Thailand! A successful media launch here in Hong Kong promoting English beef for the GREAT campaign, Ken’s recipe with Asian flavours and using Maldon sea salt was a hit! The Chinese press was impressed with the aroma and taste of British beef paired with Asian spices. Choice cuts of beef and beer to cheer promoted in HK! 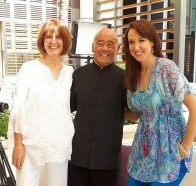 Having a wonderful time filming with the biggest home shopping TrueSelect channel in Thailand, sharing the Ken Hom wok with Thais!! Ken’s book ‘My Stir-Fried Life’ seen in Angkor Wat! – At Christian Develter’s studio. 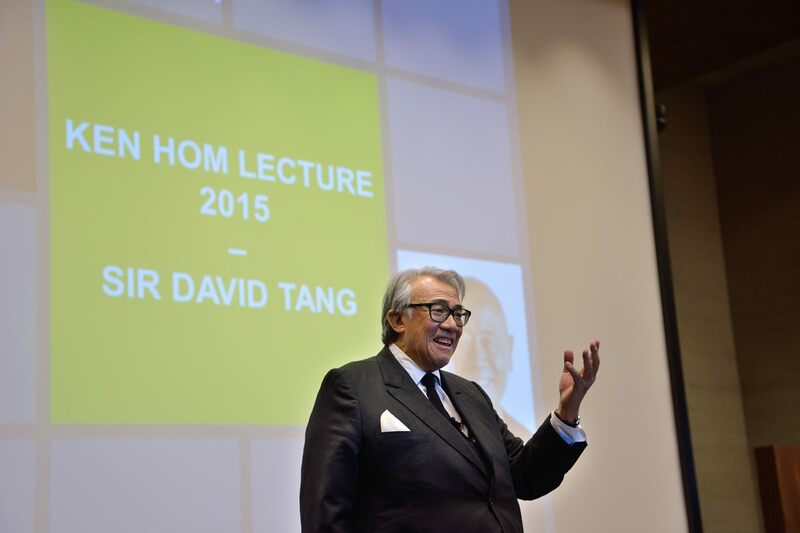 Sir David Tang delivered the 2015 Ken Hom Lecture at the Oxford School of Hospitality Management at Oxford Brookes University. The event hosted by Ken on 24th November was a huge success. A special “Dinner with the Stars” was held on 16 September at the Copacabana Palace hotel. 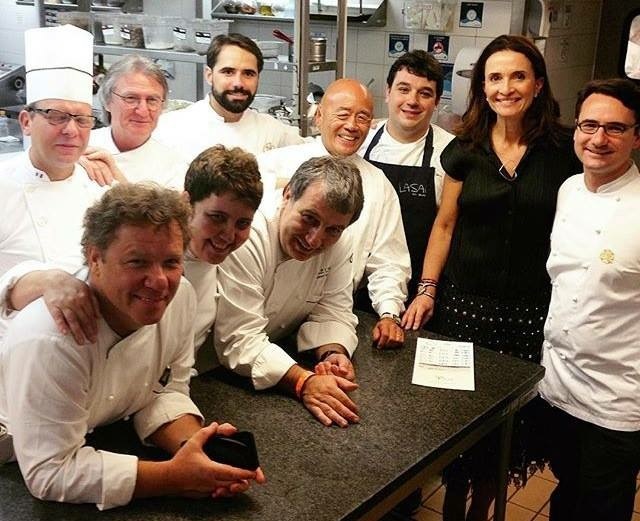 Charity dinner with the six Michelin star chefs of Rio de Janeiro. All the chefs with Andrea Natal, the General Manager of the Copacabana Palace Hotel together with Pierre Olivier Petit, the Executive Chef. An amazing evening of food, wine and friendship among chefs! Ken at the Milan Expo with the GREAT campaign and meeting Lord Bilimoria (chairman of Cobra) in Milan after many years! Ken appeared in “Back In Time For Dinner” on the 7th April 2015. A BBC2 series starting in which one British family embark on an extraordinary time-travelling adventure to discover how a post-war revolution in the food we eat has transformed the way we live. Appointed GREAT ambassador by Prime Minister David Cameron for work promoting the United Kingdom.